Earlier in the day, Tania and I had ridden 30 some odd miles as part of the Market to Market bike ride. Although Tania regularly goes on such lengthy rides, I’m not nearly as regular with my exercise. (And it’s a long way from the North Market to the Hills Market and back!) So when it came time to decide on an evening menu, I wasn’t interested in something that was going to require too many steps—I wanted something easy that provided plenty of time for rest and relaxation. Under the circumstances then, a marinade was perfect. Once mixed up, I could sit back and let it do all the work. My inspiration came from a favorite food blog of mine, “The Way the Cookie Crumbles.” (See food blogroll to the right.) They had a recipe for Honey Ginger Pork Tenderloin that sounded amazing. Even better, it sounded easy. Several hours later, the marinade having done it’s work, I set about firing up the grill. Any serious griller should have a chimney starter. 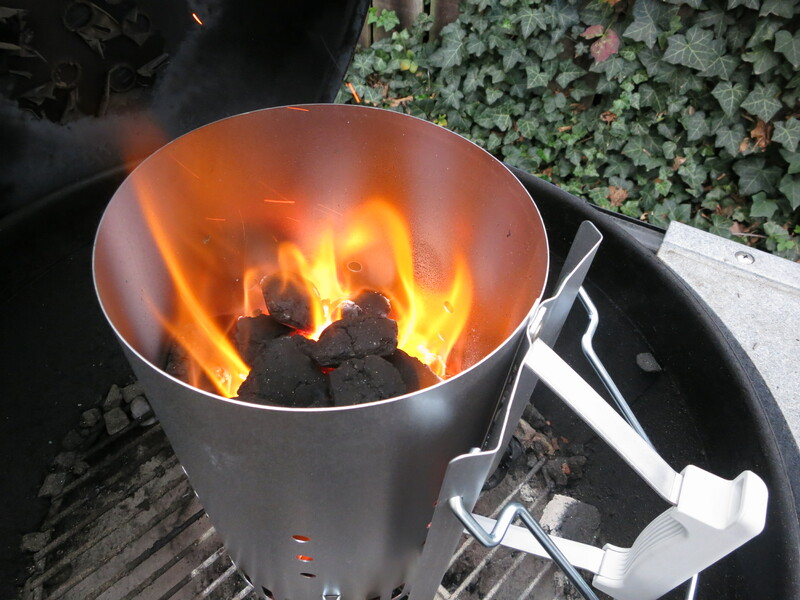 A chimney starter is great because it gives you the maximum degree of control over the amount of charcoal you use and how it gets distributed within the grill. For this recipe, I set up the grill to allow for indirect heat. Out of the marinade and onto the fire! 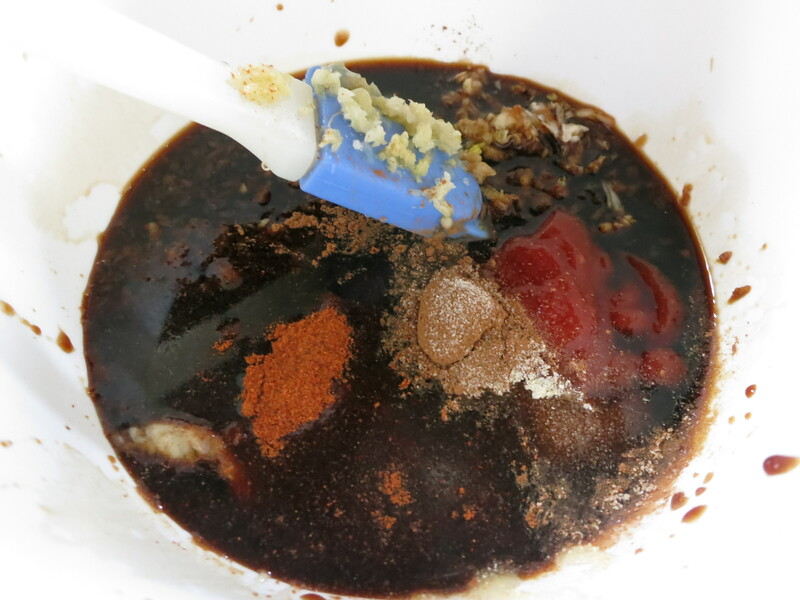 With both brown sugar AND honey in this recipe, there is a LOT of sugar in the marinade. As a result, grilling the pork requires close attention and some grilling skill and experience. If you’re not careful, your meat will blacken and burn long before it comes anywhere close to being done. But, if you keep the meat away from direct flame and pay close attention, you’ll end up with a beautifully caramelized crust that is just to die for. To avoid a raw hunk of carbon-ized pork, make sure you place your meat off to one side and not directly over your bed of coals. Also, turn the pork frequently; you don’t want any one side to face the heat for too long. 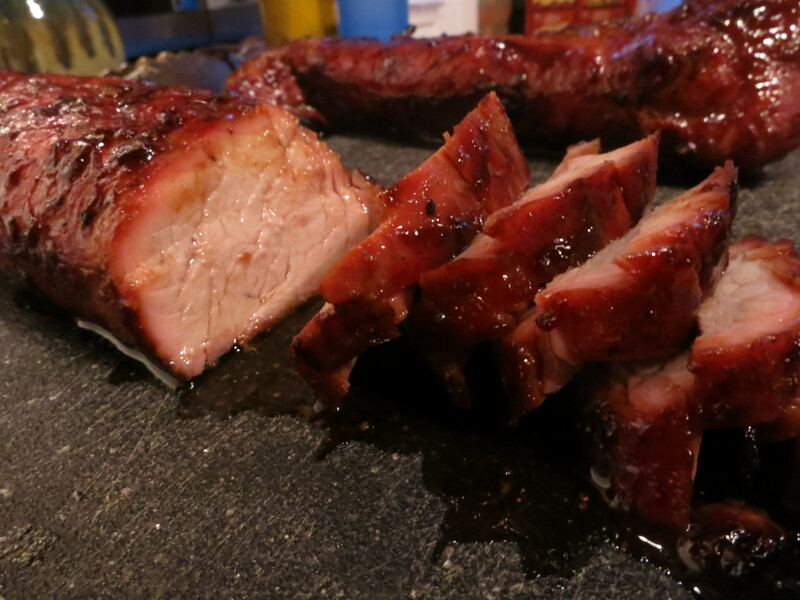 Finally, when basting the pork, make sure never to turn a freshly basted side towards the heat. 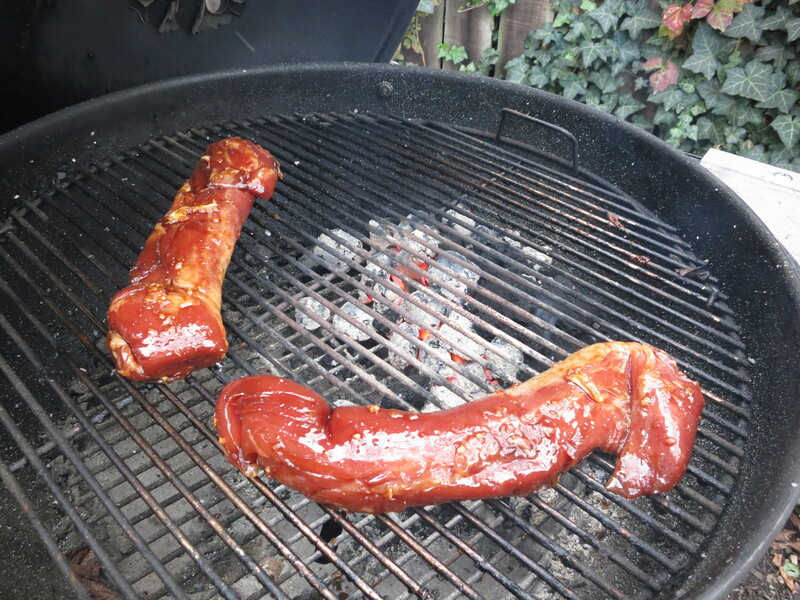 Speaking of basting, the recipe calls for using your left-over marinade as a glaze with which to baste the tenderloins. You may be tempted to use the marinade straight from the bag. Don’t do it. That marinade has had raw meat sitting in it for anywhere from 4 to 24 hours. It isn’t going to get hot enough on the grill to kill anything that may have contaminated it over that time. Instead, empty it into a small sauce pan and bring to a boil for several minutes. The final pork-related instructions should not come as a surprise to anyone who has ever read anything about cooking meat: let the meat sit for at least 5 minutes before cutting into it. Marinade, preferably from 8 hours up to a fully day. Shorter won’t ruin the recipe—I did mine for 4 hours. Prepare grill for indirect grilling. Place tenderloins at the edge of the coals, taking care to not get them too close to the heat. 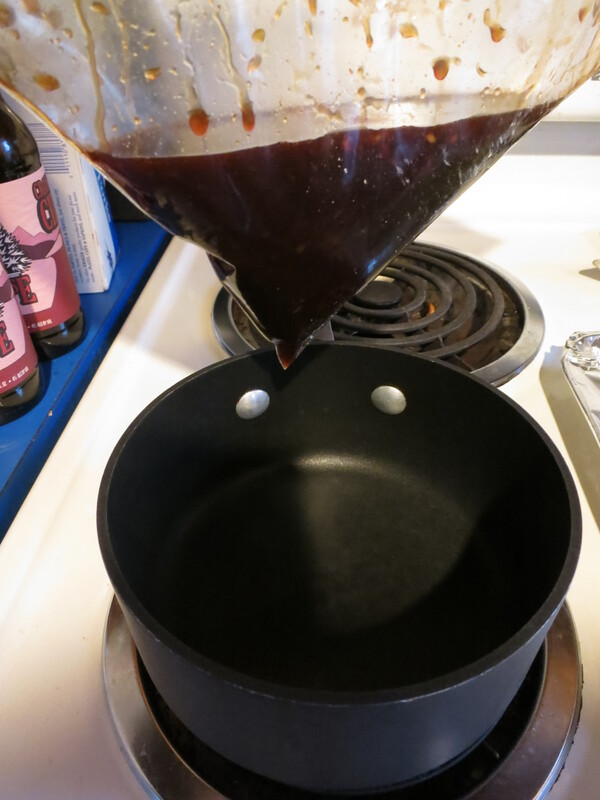 Empty remaining marinade into a small sauce pan and bring to a boil. Boil for several minutes, stirring to prevent burning. 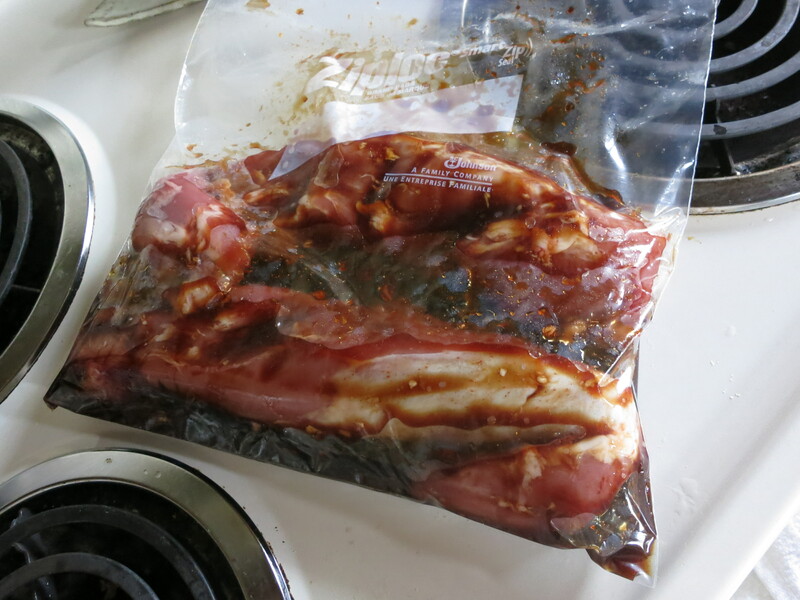 Baste the pork with the marinade. Turn frequently to avoid burning. Cook until the tenderloins reach an internal temperature of 155-160 degrees F.
Remove from grill and let stand for 5 minutes before slicing. Slice thinly on a bias. Finally, no one usually eats just meat for a meal. 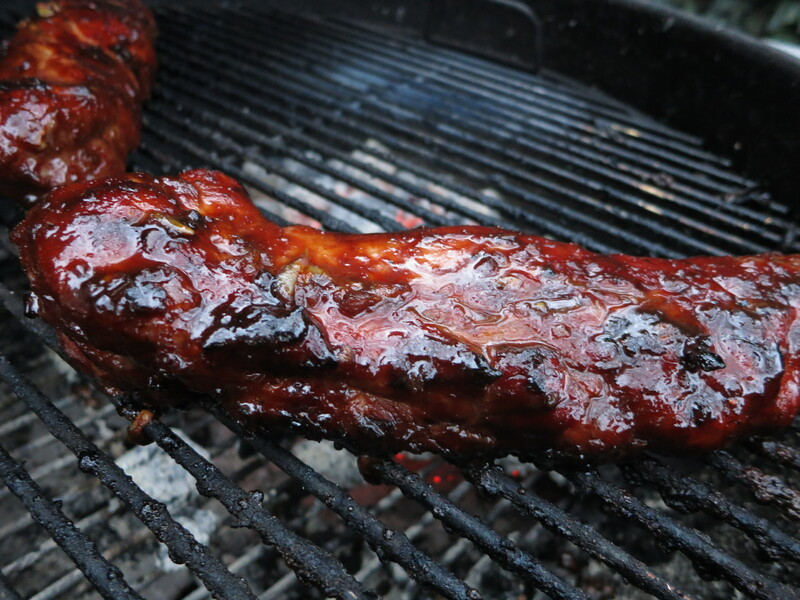 (Unless we’re talking BBQ, in which case, eat away.) You need something else to go along with it. In this case, I opted for roasted broccoli. Growing up, if we were eating broccoli, more often than not it was frozen before being steamed. While fine, I recently realized that I had been missing out on all that this green vegetable had to offer. For when roasted, broccoli takes on a whole new depth of flavor. Not only that, but it’s easy. And it provides the opportunity to season it to match the dish you’re pairing it with. In this case, I opted for a little bit of fresh garlic. Arrange broccoli florets in a single layer on a cookie sheet. Sprinkle with a generous amount of salt, the minced garlic, and freshly ground pepper. Toss together. Roast until done, approximately 15-25 minutes. You want the broccoli to brown slightly, but not too much—and certainly not blacken.